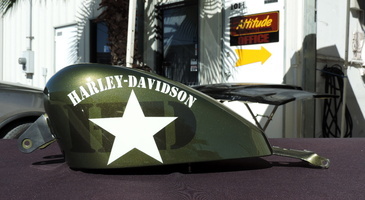 We had to repaint this Sportster tank and color match the Olive gold color (we used the factory paint on the mounting tab as a color match reference). 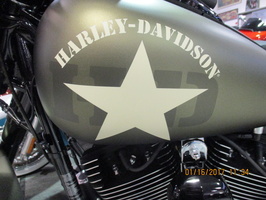 The customer wanted to the same paint scheme as the softail tank with the white star and Harley Davidson lettering with darker green "H-D" lettering behind it. Very tricky to do this as we could not order any of the colors so we had to try to match the white and darker green colors to a picture. Really came out nice!